The nearest habitable world beyond our Solar System might be right on our doorstep - astronomically speaking. 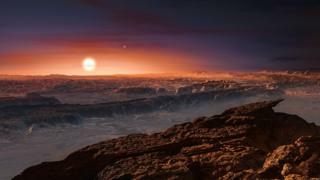 Scientists say their investigations of the closest star, Proxima Centauri, show it to have an Earth-sized planet orbiting about it. What is more, this rocky globe is moving in a zone that would make liquid water on its surface a possibility. Proxima is 40 trillion km away and would take a spacecraft using current technology thousands of years to reach. What makes a planet "potentially habitable"? Nonetheless, the discovery of a planet potentially favourable to life in our cosmic neighbourhood is likely to fire the imagination. "For sure, to go there right now is science fiction, but people are thinking about it and it's no longer just an academic exercise to imagine we could send a probe there one day," said Guillem Anglada-Escudé whose "Pale Red Dot" team reports the existence of the new world in the journal Nature. Earlier this year, the billionaire venture capitalist Yuri Milner said he was investing $100m in studies to develop tiny spacecraft that could be propelled across the galaxy by lasers. These would travel at perhaps 20% of the speed of light, shortening the journey to a star like Proxima Centauri to mere decades. Just how "habitable" this particular planet really is, one has to say is pure speculation for the time being. The Queen Mary University of London researcher and his group concede they still have much work to do to extend their observations. Simply identifying the world, catalogued as "Proxima b", was a considerable challenge. It was made possible through the use of an ultra-precise instrument called HARPS. This spectrograph, attached to a 3.6m telescope in Chile, detects the very slight wobble induced in a star when circled by a gravitationally bound planet. Its data suggests Proxima b has a minimum mass 1.3 times that of Earth and orbits at a distance of about 7.5 million km from the star, taking 11.2 days to complete one revolution. 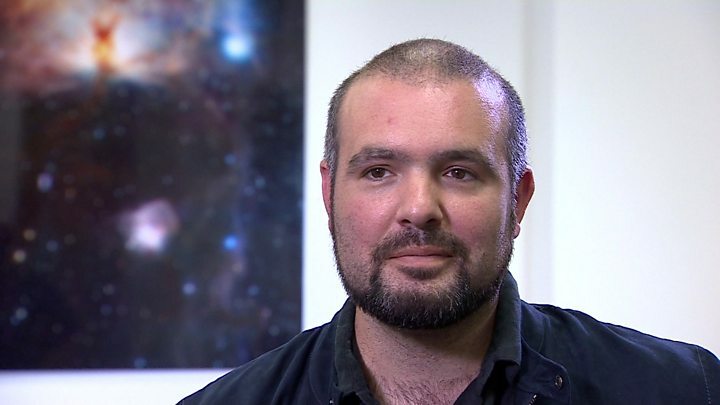 Media captionDr Anglada-Escudé: "It gives us a target; we have a reason to go now"
The distance between the star and its planet is considerably smaller than Earth's separation from the Sun (149 million km). But Proxima Centauri is what is termed a red dwarf star. It is much reduced in size and dimmer compared with our Sun, and so a planet can be nearer and still enjoy conditions that are potentially as benign as those on Earth. "This planet is at 5% of the Earth's distance from the Sun. However, Proxima is 1,000 times fainter than the Sun. So the flux - the energy - reaching Proxima b is about 70% of what the Earth receives. It's like taking Earth a bit further away, but it's comparable," explained Dr Anglada-Escudé. Whether the temperatures on Proxima b are favourable for life to exist is going to depend on the presence of an atmosphere. An envelope of greenhouse gases would warm surface conditions and provide sufficient pressure to keep water - essential for biology - in a liquid state. But even with the limited information we currently have, scientists are excited by the news. "I think it's the most important exoplanet discovery there will ever be - how can you ever trump something that could be habitable orbiting around the very closest star to the Sun?" commented Dr Carole Haswell from the Open University. "When I was a kid, it wasn't clear there were any other planets that we could walk around on and find liquid water on - so I think it's absolutely thrilling," she told BBC News. This is a huge moment in the search for alien worlds. Until 1992, the only planets anyone knew about were the ones in our own solar system. But since then thousands more have been found orbiting distant stars and the belief is that the galaxies may be teeming with them. Most would be extremely inhospitable to life: too big or too hot or too cold. The newly found Proxima b does not sound like much of a paradise either. It is roughly Earth-sized and should be the right temperature for liquid water but it is bathed in sepia light and vulnerable to violent flares so it is definitely not Earth-like. However the fact that it is so close to us - in the relative terms of deep space - suddenly improves the chances of investigating if an exoplanet can be genuinely habitable. So expect this announcement to trigger a mass swivelling of telescopes towards a very particular point in space. In just two decades, astronomers have moved from amazement at finding any new worlds at all to discovering the most tantalising of them all right on their doorstep. Researchers are presently looking to see if the planet crosses the face of Proxima Centauri as viewed from Earth - an event referred to as a "transit". This kind of backlit observation could confirm not just the existence of an atmosphere but reveal perhaps something of its chemical properties. Indeed, researchers have long talked about using transits to try to detect the signatures of life on planets that are too far away to be visited by spacecraft. If there are lifeforms on Proxima b - even simple microbes - they may find the going rather tough, however. Red dwarfs are very active. They tend to throw out big flares that would bombard a nearby planet with energetic particles. The X-ray emission is much more intense as well. Even so, these kinds of stars are now the subject of great interest in the search for Earth-like planets simply because they are so abundant in the galaxy. One priority for the future will be to get a direct image of the planet. This should be possible with the European Extremely Large Telescope now under construction in Chile. It is being given a 39m-wide primary mirror and state-of-the-art instrumentation precisely to do this kind of observation. "A planet around even a wimpy star like Proxima Centauri is going to be more than a billion times fainter than the star itself. So, what you do is block out the light from the star using a special device and that allows you then to go deeper into the star's surroundings," explained Cambridge University's Prof Gerry Gilmore. "This is one of the E-ELT's design goals. There's also a Nasa mission under development called W-First. It will have a high-resolution coronagraphic mode which again is designed for the same purpose."